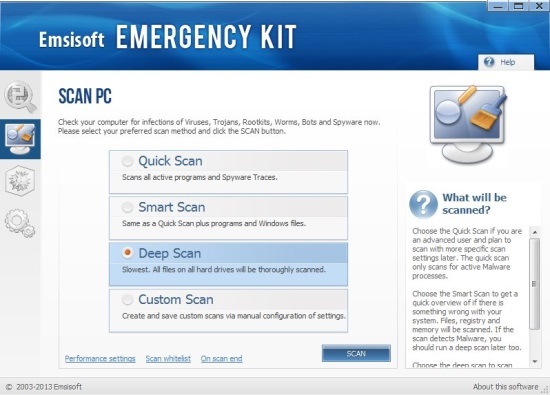 Emsisoft Emergency Kit is a free malware removal software that helps in removing harmful virus and malware from your PC. It offers a nice collection of tools to remove spyware, adware, keyloggers, trojans, and other harmful programs from infected PCs. The software categorize similar tools under one module (section), and lists 4 different modules on its interface. The Emergency Kit Scanner module list tools to scan and remove infections from disk drives. The Commandline Scanner also offers the same functionality, but with command line interface. The HiJackFree module contain tools that lets you manually analyze active processes for malware and other infections, and Blitzblank module contain tools that allow experienced users to check or delete files, drivers, or invalid registry entries. An interesting thing about this free malware removal is that it allows you to create your own Emergency USB recovery stick by extracting its contents to a flash drive. Thus you can take this portable emergency kit tool anywhere and clean infected PCs easily. Some other free malware removal utilities you can check out: Panda SafeCD, VIPRE Rescue, and SARDU. 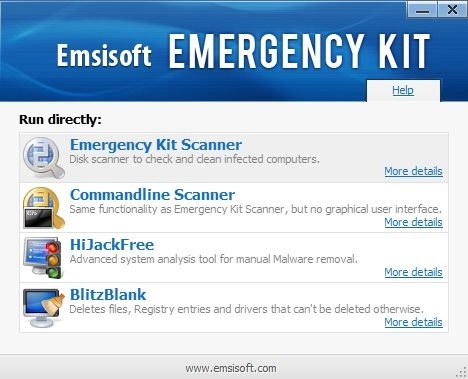 Emsisoft Emergency Kit is quite easy to use. It can be used at basic level to remove infections like worms, keyloggers, trojans, etc., and can also be used to perform advanced system security functions like scanning memory, active processes, or system registry to clean malware and other threats. Installation is easy for Emsisoft Emergency Kit. Just download and double click on the executable (.exe) file to install this free malware removal on your PC. Once installed successfully, you can use it to scan harmful malware, and then remove or quarantine them. The Emergency Kit Scanner module is simple, but rest of the modules (Commandline Scanner, Hijack Free, and Blitzblan) require advanced system knowledge and are meant for more experienced users. Each module opens in a separate window and works separately. With Emergency Kit Scanner, you can perform quick scan, smart scan, deep scan , or custom scan. With Commandline Scanner you can scan system files through command prompt. With HiJackFree module you can monitor active processes, ports, services, and delete or quarantine the suspicious ones. And the Blitzblank module is to be used with caution, since it allows you to dump or remove objects by executing commands. Free malware remover for Windows. Organize malware cleaner tools in four different modules. Removes worms, trojans, keyloggers, and many other malware. Compatible with all latest versions of Windows. Options to remove or quarantine malware. Options for advanced users to manually remove malware. You are advised to install some good free antivirus, like Microsoft Security Essentials or AVG Free Antivirus in your PC after the malware clean-up process.